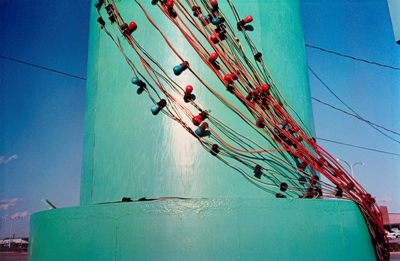 There’s plenty to do and see at LACMA this weekend, starting with a few brand new exhibitions: William Eggleston: Democratic Camera—Photographs and Video, 1961–2008, on view inside BCAM, includes roughly 200 photographs from Eggleston’s celebrated career; on the same floor, Blinky Palermo: Retrospective 1964–1977 is the first comprehensive U.S. exhibition of this German artist who had an incredible impact on postwar abstract expressionism. Both shows open to the public on Sunday. But good news if you’re a member: the exhibitions are on view now for Members-Only Preview Days. If you’re not a member but you join today or tomorrow, you’ll get right in to the shows. We have lots of Eggleston-related programming happening this weekend and next week—read on for more info. Also on view now is an installation by Mexican artist Teresa Margolles, just outside the Resnick Pavilion. The exhibition is part of VIA, a year-long, multi-site exhibition organized by LAND, featuring public works created by contemporary artists from Mexico. 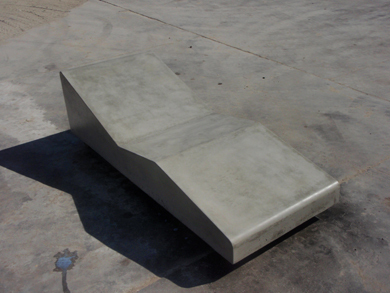 Margolles’ installation of benches is the perfect place to have a seat if you’re here on Halloween—the cement used to create the benches was mixed with a liquid that was previously used to clean corpses in a Mexican autopsy room. Speaking of Halloween… I hope you bought your tickets for our annual Muse Costume Ball on Saturday night—because it is now completely sold out. On the public programs front, tonight’s free Jazz at LACMA performance comes courtesy the Harold Land Jr. Trio with guest vocalist Rita Edmond. Also tonight, another terrific double-feature as part of our 20th Anniversary Tribute to the Film Foundation. First up is the quintessential Hitchcock film, Shadow of a Doubt, followed by Fritz Lang’s 1946 spy flick Cloak and Dagger. On Saturday, photographer David LaChapelle and artist Josh Azzarella will be in conversation in the Bing Theater, including a screening of Azzarella’s short film, Untitled #100 (Fantasia), which takes Michael Jackson’s video for Thriller as its topic. The conversation is free—first come, first served. On Sunday evening, should you wish to escape the trick-or-treaters and costume-clad pumpkin-smashers, our free Sundays Live concert series continues with a quartet of piano, bassoon, guitar, and clarinet performing works by Poulenc, Beethoven, and Mozart. That’s a lot to see and do in one weekend, but there’s even more if you’re a William Eggleston fan. On Sunday at 1:30, filmmaker Michael Almereyda will join us for a screening of his documentary, William Eggleston in the Real World, followed by a conversation between Almereyda, writer Lloyd Fonvielle, and LACMA’s Eggleston curator, Edward Robinson. Dipping into next week, you ought to mark your calendars for Tuesday night, when William Eggleston himself will be here to debut a new print published by LACMA on the occasion of the exhibition. Eggleston will join Edward Robinson in the Art Catalogues bookstore in the Ahmanson Building at 5 pm. Following that everyone will be encouraged to head up the street to the Cinefamily to see Eggleston’s 1974 film Stranded in Canton. There are even more Eggleston-related programs in the days following—check the main exhibition page for more event details. Built in 1939, the old May Company department store, later turned LACMA staff offices, had a tearoom/restaurant on the fifth floor. The tearoom was a place where local women would come and play card games. 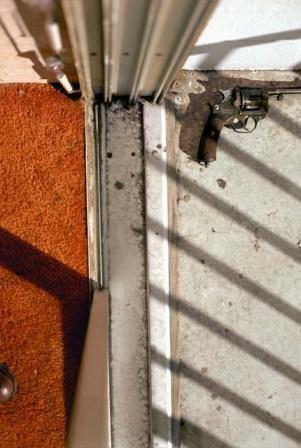 In 1989, a Culver City woman was playing cards with her friends when her estranged husband walked up, pulled out a gun, and shot her; eventually turning the gun on himself. It was reported by one of the tearoom employees that these women were so serious about their game that, although there were two bodies lying on the floor, they pleaded with police officers to let them past the crime scene tape to continue their game. I had heard rumors of a ghost that haunts LACMA West at night, but this was before I knew this story… Guards and employees have reported having apparitional experiences that range from sightings of both a man and a woman, to strange noises, to the feeling of a supernatural presence and the feeling of someone/something breathing down their necks. All of these occurred when no one else was on the floor or even in the building. 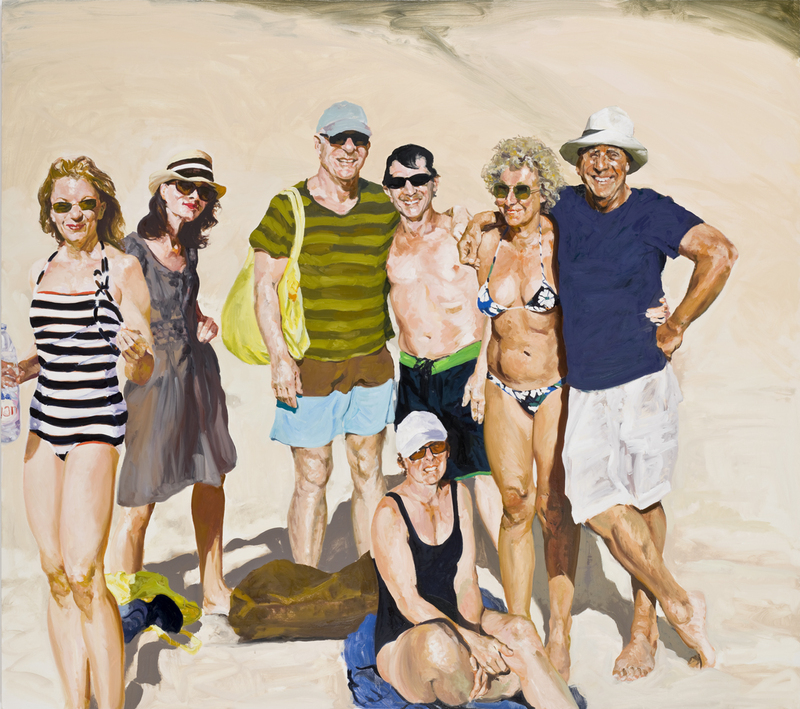 The painter Eric Fischl was in Los Angeles recently and stopped by LACMA to see his painting, St. Barts Ralph’s 70th, which he has generously lent to the museum and around which I developed a small installation including some related works from our permanent collection: Alex Katz, Eric Fischl and the Beach Scene (on view through November 28). Eric kindly agreed to take some time to talk with us about his big, vibrant painting of his friends on vacation and to let us record him doing so. His responses to my questions got right to the heart of what I loved about the painting and had responded to so enthusiastically—its cheerful subject matter and brilliant execution for starters. We then had a chance to walk through the American art galleries, as Eric had not seen our collection for some time. There were a few works that really caught his eye and when I heard the painter in him responding to these masterpieces in our collection, I had to capture that on video too. As a curator who focuses on our historical American art collection (artists active before 1968), I was thrilled to talk with a living artist about the art of painting. 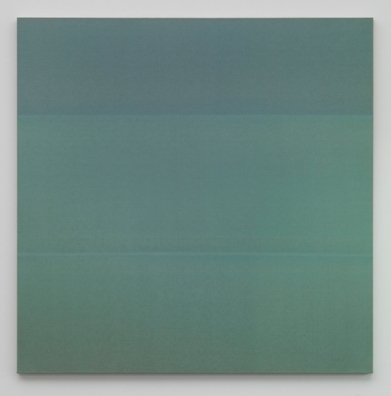 I love how clearly Eric describes his own practice and what makes a great painting. Can You Spot the Fake Buttons? My mission: to recreate missing buttons for an eighteenth-century waistcoat in time for the opening of Fashioning Fashion earlier this month. Here was a six-button waistcoat with not one, but three missing delicately crafted buttons. The bottom half of the buttons seemed easy enough—silk fabric pulled over a flat disk form, somewhat loose at the bottom for sewing the buttons onto the vest. The challenge was the top half of the existing buttons. They were very delicate, embroidered with shimmering aged silver metallic filaments that were fashioned into an intricate pattern. It was very unlikely that I could replicate, in the same material, the detailed design much less match the color of the oxidized silver strands. I might have attempted it if only one button was missing, but I needed to make the three replacements quickly. Making a silicone mold from an original button was not an option, so I sculpted an epoxy putty model of one of the original buttons. It was impossible to create an exact copy because of the numerous fine lines making up the pattern. The epoxy putty crumbled when I tried duplicating the thin filaments laying side-by-side. After sculpting an acceptable model of the top half of the button, I made a silicone mold for casting the buttons, mixing up a two-part system and letting it cure. I removed the model button and cast the replicas in epoxy putty. It was quite easy to push the mixture into the negative hollow of the mold. I removed each epoxy button form before it completely hardened to allow me to work a little more detail into each. The pink silicon mold was made from a sculpted copy of an original button. 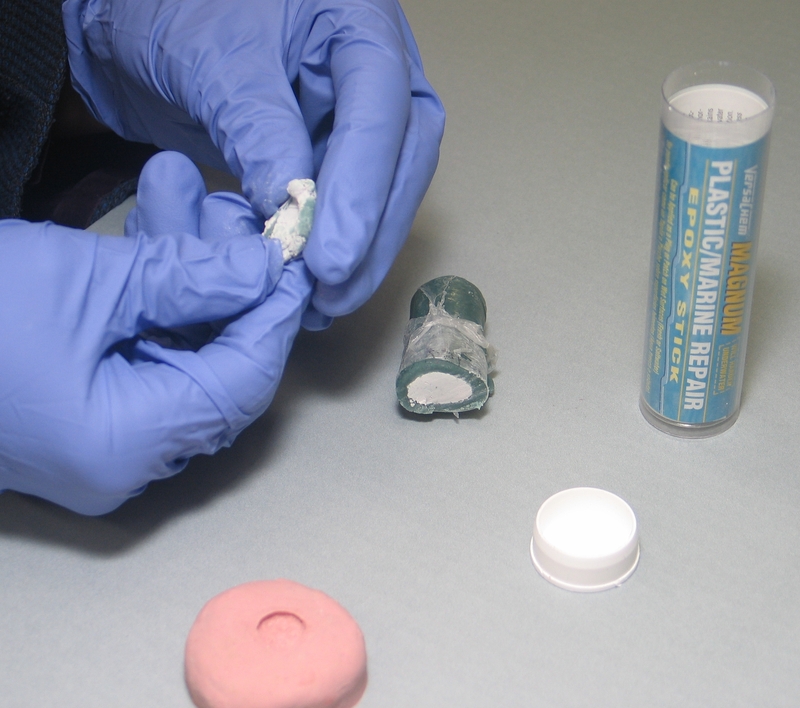 Here the mold is used to cast three reproduction buttons using epoxy putty. The epoxy button was removed from the mold before it was completely cured. Modeling tools were used to sharpen the details. Then I toned the fabricated buttons with watercolors and Mica pigment. I applied thin layers of paint, gradually adding more color, to imitate the shade and depth of the original silver strands. As a protective layer, I sprayed Testors Dull Coat on top of the painted button forms. After curing, the cast epoxy button was toned to match the original buttons with mica pigment and water colors. Lastly, I joined the top and bottom half of the button sections together using PVA adhesive. The buttons were now complete. Mission accomplished! Tonight you have your choice of free activities starting at 6 pm. As usual, our Jazz at LACMA series will take place on the plaza, with this week’s performance courtesy the Louis Van Taylor Band. Van Taylor plays a variety of saxophones and other woodwinds, and has performed with the likes of Ray Charles, the Gap Band, and many others. 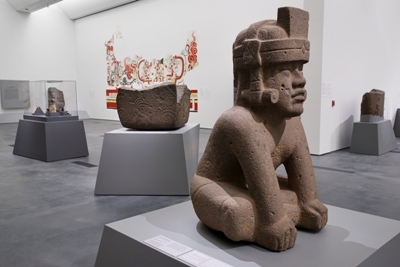 Over in the Bing Theater, also starting at 6 pm and also free, is the first event in a two-day program held in conjunction with Olmec: Colossal Masterworks of Ancient Mexico. Exhibition curator Virginia Fields will moderate a panel made up of scholars from Yale University, UC Davis, Florida State University, and the University of New Mexico, Albuquerque, who will discuss the latest research and discoveries around the ancient Olmec civilization, including evidence of a written language. This discussion serves as a prelude to a day-long Olmec symposium on Saturday, starting at 9 am and open to the public. A detailed list of presentations can be found here. On Saturday night our 20th Anniversary Tribute to the Film Foundation continues with the 1928 silent film Beggars of Life, directed by William Wellman and starring the captivating Louise Brooks. Vince Morton will provide live musical accompaniment. Sunday afternoon sees another stimulating lecture, this time on Buddhist painting in Goryeo-period Korea (918–1392). Professor Chung Woo Thak of Dongguk University will go in depth into the techniques of this highly detailed art form. 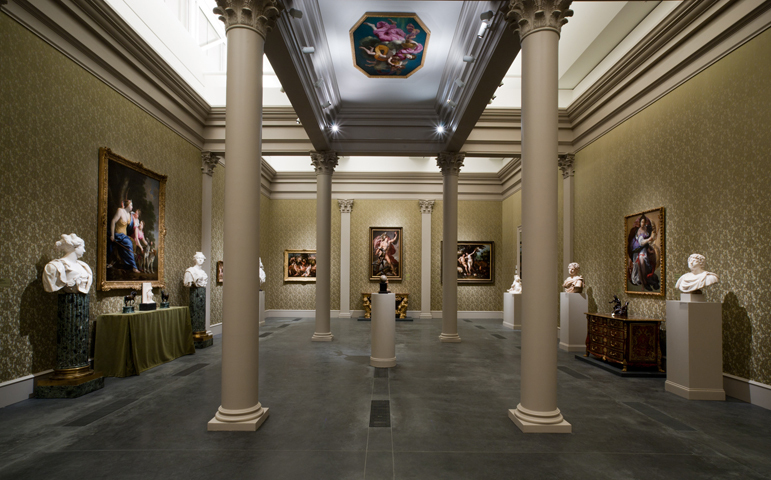 Come early or stay late to take in some masterpieces from this era in our Korean galleries. Finally, we’ll close out the weekend with the Amstel Saxophone Quartet, who have traveled all the way from Holland to perform in our free Sundays Live series. Here’s a clip of a recent performance by the quartet in Amsterdam to give you a sample of what they have in store. Yesterday we added to the collection two paintings that mark very different moments in the history of New Spanish (Mexican) painting. The first is an imposing work by Pedro Ramírez that portrays the Marriage of the Virgin. Ramírez is a seminal artist from the second half of the seventeenth century who descended from a prominent Sevillian family of sculptors and altarpiece-makers. His bold compositions are characterized by stark contours and firm modeling and a high degree of naturalism. 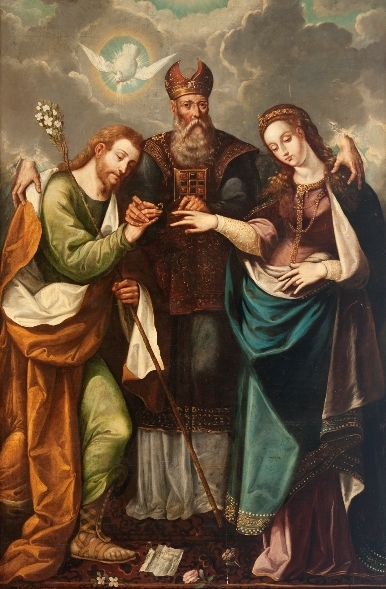 This scene is based on apocryphal accounts of the marriage of the Virgin in the Golden Legend. While the subject was not all that common in Europe, it became popular in New Spain, where it was taken up by some of the best brushes of the time. Here, the Jewish priest in the center is flanked by the holy couple. Among the most striking details, are the priest’s hands, with every knuckle clearly drawn. The scene is presided over by the Holy Ghost, beautifully rendered within a circle of light, as two majestic hands descend from the heavens to embrace the couple and sanctify the union. This is an unusual detail that recurs in all of the New Spanish paintings of the subject, but which is conspicuously absent from the European models. It is possible that the artists shared a common visual source (either a print or a painting not yet identified), but it is even more likely that they were looking at each others’ work, demonstrating the significance of a local pictorial tradition within Mexico itself. By the early eighteenth century a major stylistic change was introduced in New Spain. The firm modeling seen in works such as Ramírez’s is replaced by a softer, more vaporous style. Juan Francisco Aguilera is credited along with the brothers Juan and Nicolás Rodríguez Juárez with propelling this pictorial shift. Despite Aguilera’s importance, we still lack the most elemental information about his origin and training—if he was born in Spain or Mexico. We do know, however, that by 1722 he was in Mexico City, where he was a member of the first academy of painting established by the Rodríguez Juárez brothers, and hence part of this influential modernizing group. 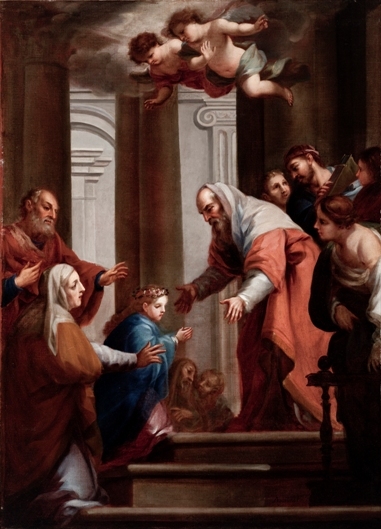 The Presentation of the Virgin to the Temple, signed in the lower center, exemplifies Aguilera’s unmistakable style, especially the fluid and soft rendition of the two cherubs who hover benevolently above the scene. The scarcity of known works by Aguilera makes this acquisition highly significant in terms of understanding the artist’s development. The two works by Ramírez and Aguilera together anchor our growing collection of Spanish colonial painting by allowing us to tell the story of the transition of seventeenth and eighteenth century painting in New Spain. We could have not asked for better examples to do so. For the past few months I have been in the brand new Resnick Pavilion every day during the installation of its three inaugural shows. 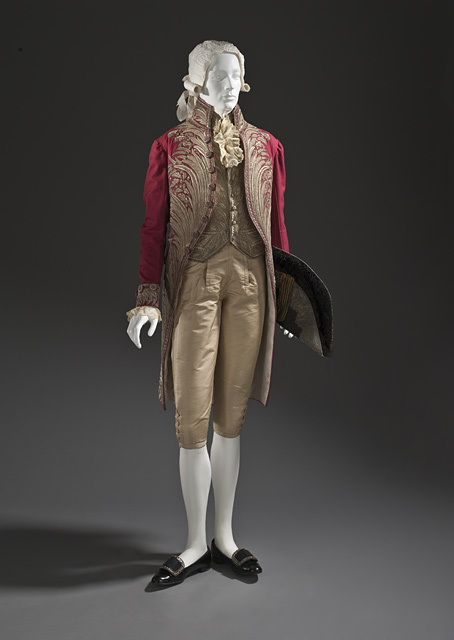 Two of the exhibitions, Fashioning Fashion and Eye for the Sensual, were designed by Pier Luigi Pizzi and Massimo Gasparon, opera/costume designers from Italy. 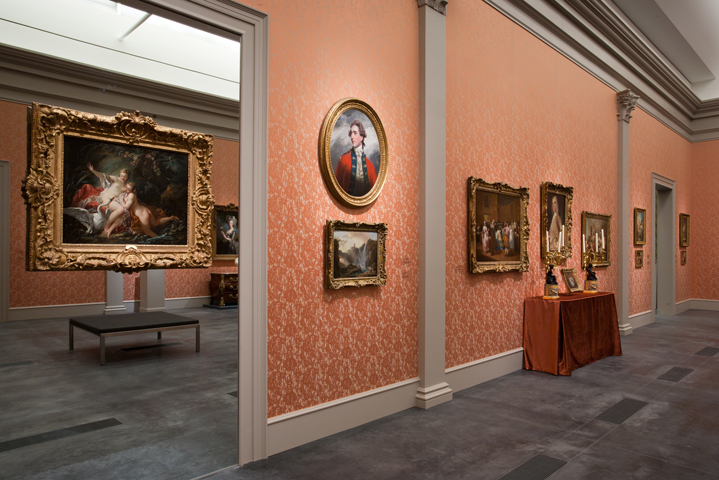 Since all of the pieces in Eye for the Sensual are part of Lynda and Stewart Resnick’s personal collection, Pizzi and Gasparon wanted the show to look like it was hung in someone’s home; albeit a sumptuous, elegant, palatial home. I spoke with Massimo last week to find out more about the wall coverings, which are made of a fabric created by the Italian company Rubelli. You are currently browsing the Unframed The LACMA Blog blog archives for October, 2010.